What are the best strategies for using ketamine to treat major depression in the short term? Although we know that ketamine (and, now, esketamine) can be helpful we really don’t know that much about what strategy works best. The most commonly used ketamine infusion protocol is adapted from studies using ketamine to treat chronic pain. An article in the March issue of the American Journal of Psychiatry suggests that treatment three times a week may be helpful in the acute phase (standard treatment protocols have usually been twice a week) and that infusions once a week, after an initial period of two weeks of infusions three times a week, will preserve the response for at least a month without any short term evidence of tolerance (reduced response over time). The article adds to our knowledge but also highlights some significant limitations in our knowledge. Most (65%) of those who responded did so by infusion #3 (see below). However, a significant number of responders did not respond until the 6th infusion. The response was maintained for a month of weekly maintenance infusions, but we know almost nothing about what to do after that. Response was much greater than would be expected from a trial of another antidepressant, but much less than would be expected from ECT. Phillips JL, Norris S, Talbot J, et al. 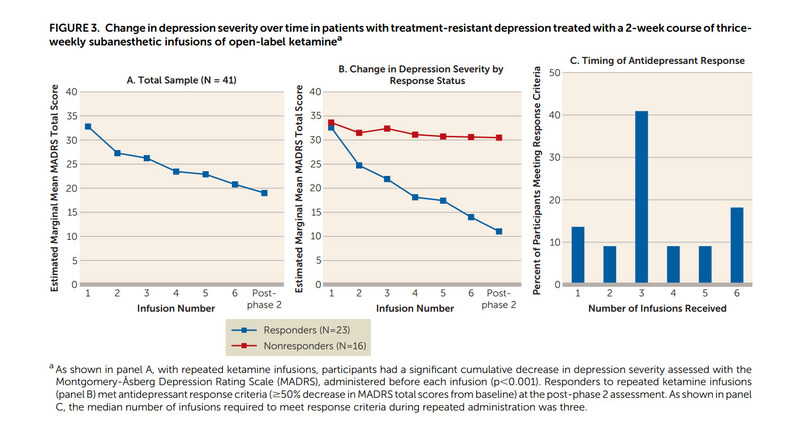 Single, Repeated, and Maintenance Ketamine Infusions for Treatment-Resistant Depression: A Randomized Controlled Trial. American Journal of Psychiatry. 2019:appi.ajp.2018.1.